The memorial is finished, the tower replacing it is occupied, and the museum is open—for better or for worse. 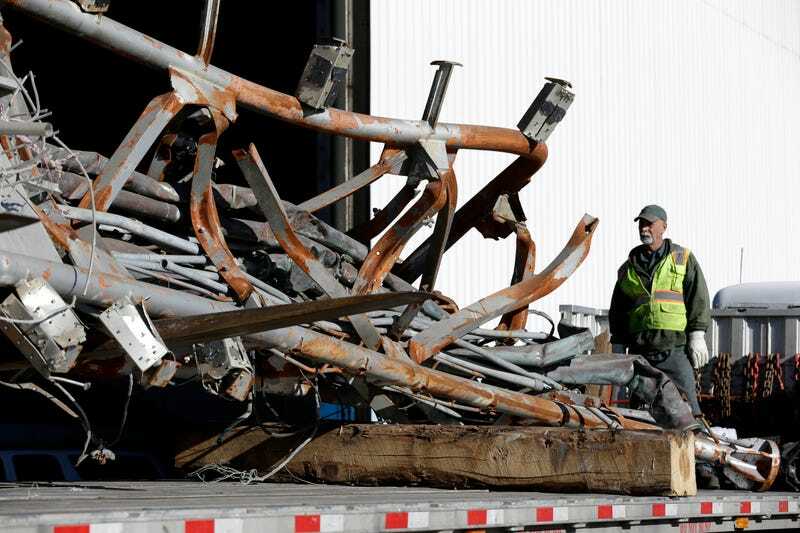 Today, several of the largest remaining pieces of World Trade Center infrastructure from the 9/11 terrorist attacks were pulled out of storage to leave New York City. Hundreds of pieces from the site were placed in a hangar at JFK airport, where they’ve remained for 14 years. Among the recovered items being moved out today were an I-beam which recovery workers cut religious symbols out of as keepsakes, a section of antenna that sat atop one of the towers, and a damaged PATH train car. All of these relics are destined for different locations. Although some artifacts were placed in the 9/11 museum, the Port Authority felt strongly that pieces should be shared with a wider community and have been shipped around the world. The only condition is that the pieces must be displayed publicly. The antenna, for example, is going to Fulton–Montgomery Community College where the school plans to mount it as part of a memorial. Still, the Port Authority plans to have all the pieces out by March, at which time the hangar will be demolished.